This isn’t just a great looking Corvette, this is a fuel injected survivor that is believed to be the second Fuelie to leave the factory! It’s also an NCRS judged car that received 3-stars for originality, the Top Flight and Bloomington Survivor awards. 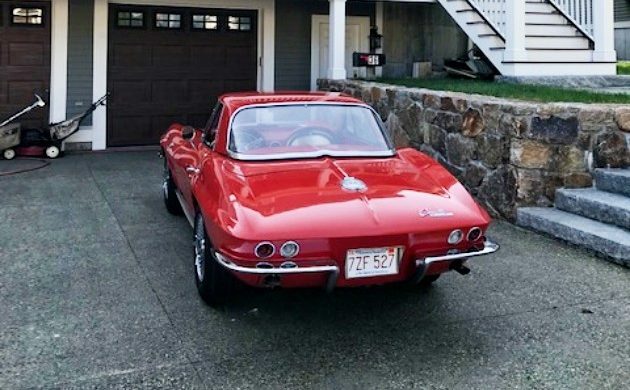 When it comes to desirable Corvettes, this one is high on the list. Reader John F has enjoyed preserving and showing this Fuelie, but he has decided it’s time to part ways with it and thought one of his fellow Barn Finders would love the opportunity to own this survivor! 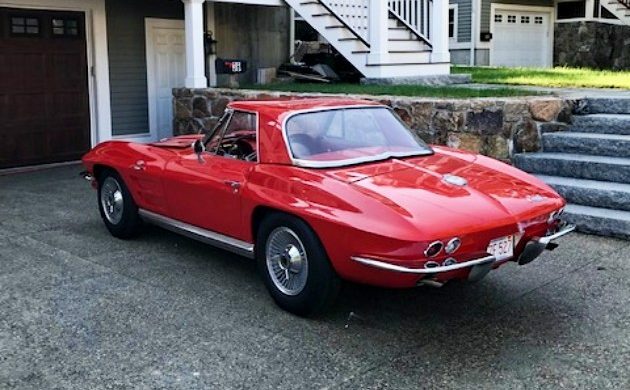 The car is currently located in Boston, Massachusetts and you can contact John with questions, to schedule a viewing or make him an offer via the form below. I’ll let John tell you a bit more about the car in his own words! What Makes It Special? This is the second known “X” block car to come off the assembly line. A survivor two top F.I., radio delete, electronic ignition, knock off wheels, P91 option and it comes with NCRS certified window sticker. 3-star NCRS survivor. Runs and drives as it should. Original paint, interior, and all numbers matching. This is a true survivor. Body Condition: All original panels, and paint. Some chips and cracks but a very solid 10 footer. Mechanical Condition: Motor and F.I. unit just gone through. Runs and drives like a daily driver of its time. No issues. There’s a good chance you have a few questions, such as what is an “X block” and what does being a 3-star NCRS survivor means. Well, X-block cars have an X suffix stamped on the block which denotes being the 375 horsepower fuel injected 327 V8 engine with the transistor (electronic) ignition and the manual transmission. This was the only trim level of the fuel injected engine offered in ’64, but it goes to verify that this is a genuine Fuelie survivor. As for the 3-star NCRS rating. That simply means that this Corvette was judged at the NCRS Nationals and was found to be factory original in at least 3 out of 4 areas. Those areas being exterior, interior, mechanical and chassis. This really is an amazing find! 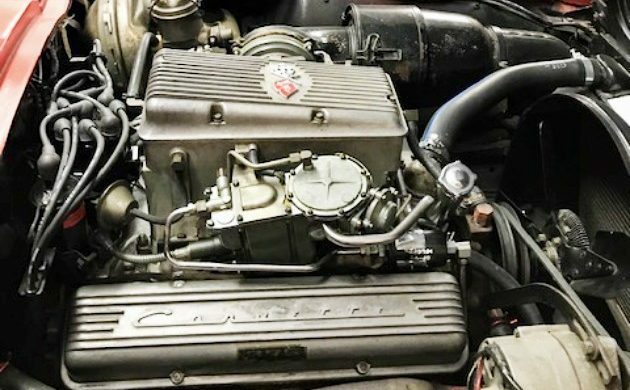 Many of these cars lost their fuel injection systems early in their lives, so having the numbers matching fuel system is impressive and important. The original alloy knock-off wheels are also present and are quite desirable. With the recent refresh of the engine, this car is ready to be driven and enjoyed. Hopefully, the next owner will continue to preserve this Corvette in it’s original state. Our thanks to John for taking such great care of this car and for listing it as a Barn Finds Exclusive! Do you have a survivor that needs a good home? 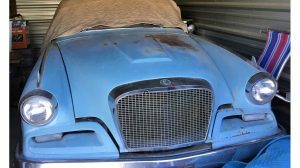 Please consider listing it here on Barn Finds! $ 4,037, but I suspect this one could reach $100,000 and possibly more depending on mileage and originality. So what do you think the final price is going to be on this blast from the past ? No radio delete. A radio was an option that was not selected on this car. Amazing survivor though and a great color. Love the turbine wheels. No need for a radio with all the sweet tunes coming off the exhaust. Very nice. 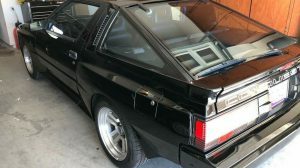 I hope the seller gets full value for this terrific looking car. …….for the 1964 model year. FI was optional on Corvettes beginning in 1957. Apparently the hood doesn’t close all the way. Not a good look for $125K. It’s my friends car. Everything works normally, he knows these cars inside and out. He restored a 67 before finding this one. Dennis Pacy in Acton MA is a known expert on these cars and can vouch for what it is. 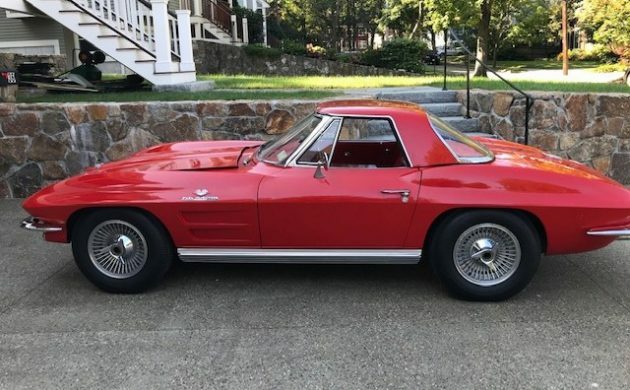 You have to know the market for this era corvette, and the level of meticulousness that these owners go to to have a car close to “correct”. And this one is 99.999% all original and of course correct. It’s impossible to get to 100% original, only close. Like a trip back in time to 1964. My dad had a ’64 327 Fuelie when I was growing up and I learned to drive stick on it. Great car with wonderful performance but it would like to slide sideways on those bias ply tires as originally equipped. Fuel injection was made right here in town at Rochester Products. One thing often not noted is the sound these cars had. Very distinctive- could here my dad coming home from a quarter mile away. I remember people saying back then that if you heard it whistling that meant the F.I. BTW, an awesomely beautiful Corvette ! Really nice car. Really optimistic price. Radio delete? That does it for me. Beautiful car. I cannot imagine selling it, but perhaps the owner has his eye on a new toy. Good luck to the new owner.